This species is found throughout most of Mississippi River drainage from Pennsylvania and New York to Minnesota and Kansas, south to Missouri, Arkansas, and Louisiana. Also in St. Lawrence River basin from Lake Ontario to Quebec. 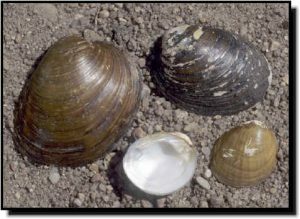 Although it has a very wide range and is considered stable throughout portions of its range, it is likely extirpated from Alabama, New York, Pennsylvania, Ohio, West Virginia, Nebraska, Kansas, the Tennessee River, and the Detroit River between Lake St. Clair and Lake Erie, Michigan/Ontario (the latter due to zebra mussel invasion). In Canada, it only occurs in a small number of rivers in eastern Ontario and southern Quebec. Comments: Based on the discovery of relic shells found in the Kansas, Ninnescah and Smoky Hill rivers, we know the hickorynut once occurred here. Thus, it is now considered extirpated. Outside Kansas, this species is found in medium to large rivers in sand and gravel substrates. It has a thick, rounded shell with inflated umbos. External color is tan to brown with faint dark rays extending from the umbo that fade out half-way down the shell. It could be confused with the round pigtoe or the pimpleback. 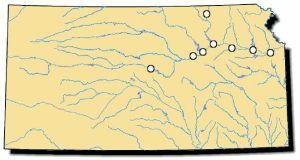 There is only one known fish host, which may be an important reason why it disappeared from Kansas.